El Greco (Spanish painter, 1541-1614), "The Resurrection" (1596-1600), Oil on canvas, 275 x 127 cm, Museo del Prado, Madrid. Larger image. Before beginning, read the Resurrection accounts in the Gospels. Try looking at them as for the first time. Ask yourself: What happened here that prompted these stories? Look for differences as well as similarities. When we come to the four accounts of Jesus' own resurrection, we see strong similarities plus a number of mainly minor differences. How reliable are the Gospel accounts of the resurrection? What do they tell us about what really happened? How are we to understand the differences? Is there a clear resurrection message? Even a casual reader will notice that the first three gospels -- Matthew, Mark, and Luke -- have many verbal similarities, while the fourth gospel seems quite different. Because they have so much common material, the first three gospels are termed the Synoptic Gospels. The word "synoptic" comes from two Greek words syn-, "together" and opsesthai, "to see". It means "presenting or taking the same or common view." Scholars have hypothesized, rightly, I believe, that the writers of the Synoptic Gospels must have had some common source document available to them that contained the stories and teachings of Jesus, some kind of proto-gospel. Scholars have a name for this hypothetical source; they call it Q, which stands for the German word Quelle, meaning "source." The gospel writers, I assume, probably drew on Q and wove it together with their own eyewitness material and other traditions to fashion an account of Jesus' life and teachings for their particular audience. Obviously each gospel writer told the story with a particular editorial purpose in mind. Mark's gospel is commonly agreed to be the earliest gospel. Matthew's gospel seems to be written especially with Palestinian Jews in mind, and takes special care to point out Jesus' words and actions as the fulfillment of Old Testament prophecies. Luke's gospel seems to speak to a Hellenistic audience. The Gospel of John, on the other hand, didn't seem to use this Q source at all. As an eyewitness, John wrote from his own mature perspective of what Jesus said and did and intended. When you compare the gospels you see some minor differences here and there. That's just the way the Gospels have been given to the Church. We may not understand the reasons for these differences; we just accept them and let the scholars spin their complex theories. The gospel accounts are similar, but each is different. Let's look at them carefully. First of all, it's pretty clear that Mark 16:9-19, the so-called "longer ending of Mark," wasn't part of the original gospel, that ended -- at least the surviving edition that we have -- with verse 8. Perhaps the last page was lost. Verses 9-19 were added by the early church because it seemed strange that Mark ended abruptly as it did. Not that these verses are misleading, but they aren't part of the original gospel. Women. In the Synoptic Gospels, Mary Magdalene and other women go to the tomb. In John's account, Mary Magdalene goes alone. Appearance to the women. In Matthew 28:9, Jesus appears to the women before they tell the disciples. In John 20:13-17, Jesus appears to Mary Magdalene (also in the longer ending of Mark) -- after she reports to the disciples. In Mark, the women tell no one of what they had seen. Number of angels. In Matthew and Mark one angel appears; in Luke and John there are two angels. Purpose of the women's visit. 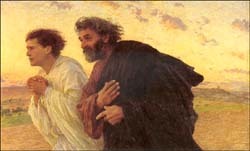 In Matthew they go to "look at" the tomb. In Mark and Luke they bring spices to anoint Jesus' body. In John the anointing took place on Friday night and no purpose for Mary's visit is given. Grave clothes. In Matthew and Mark, Jesus is wrapped in a large linen shroud (sidrōn). In John 19:40; 20:5-7 and Luke 24:12, Jesus is wrapped in strips of linen (othonion). See the discussion below. My point isn't to try to pick apart the account or cause you to disbelieve it. But to stimulate you to see what's there. Most of these differences are minor and can be explained or harmonized rather easily. A more troubling question is if eyewitnesses can't seem to get their stories straight, whether we can believe the story or not. When you think about it, you realize that these very differences validate the authenticity of the story. Whenever you have eyewitnesses testify to any event that they all see, there'll be minor points of difference in what they saw and how they perceived the event. If all the eyewitnesses agree in every detail, a good investigator begins to suspect collusion between the witnesses before testifying. The Church has been aware of these minor differences in the resurrection accounts for many centuries. Some might express concern with how this might affect our doctrine of the authority of scripture (2 Timothy 3:16). But surely our understanding of the inspiration of scripture must be large enough to encompass the gospel accounts as we find them. Rather than seeing these accounts as evidence of error, the Church has viewed them as evidence of authenticity, representing various eyewitness traditions that are remarkably united on the main points. Q1. What differences do you find between the various resurrection accounts? How do you account for differences in eyewitness testimony? How might these differences add to the credibility of the witnesses? Jesus was dead and buried. The disciples were not prepared for Jesus' death. They were overcome with confusion. The tomb was found on Easter morning to be empty. But this in itself didn't inspire faith. Mary thought the body was stolen. The disciples encountered a number of experiences which they took to be appearances of Jesus risen from the dead. It is possible to so analyze the event that we miss the big picture: That Jesus who was dead had been raised from the dead. Other women also saw him and touched him (Matthew 28:9). Jesus appeared to Peter and the other apostles (Luke 24:34; 1 Corinthians 15:5; Mark 16:14 longer ending; Luke 24:36). Jesus appeared to Thomas (John 20:26-28). Later, Jesus appeared to more than 500 people at one time (1 Corinthians 15:6). Q2. What similarities do you find in the resurrection accounts? Based on the agreements between the accounts, what seems to have happened? All the accounts credit Joseph of Arimathea with wrapping Jesus' body in a linen cloth (sindōn) or linen cloth wrapping (othonion). Two words are used here for the grave wrappings. "Fine linen" (KJV) or "linen cloth" (NRSV, NIV) is sindōn, presumably a large piece of linen in which the body was carried from the cross to the tomb, and then wrapped around him. Though some see a conflict between "strips of cloth" and a large linen cloth, I don't see any. When you compare Luke 23:53 (sindōn) with Luke 24:12 (othonion) it appears that Luke, at least, is using the terms synonymously. "The Disciples Peter and John Running to the Sepulchre on the Morning of the Resurrection" (1898), by Eug�ne Burnand (French painter, 1850-1921), Paris, Mus�e d'Orsay. Larger image. What was so startling? That the linen was lying there neatly. If Jesus' body had been stolen, grave robbers wouldn't have taken the time to unwind the shroud. In fact, the shroud would have helped them carry the body more easily. If Jesus had been in a coma and revived, somehow he would have had to unwind the grave shroud in order to walk free. The grave clothes didn't need to be unwrapped to let Jesus out, he passed from the grave clothes while they were still rolled up around his body. Q3. (Luke 24:12; John 20:6-8) What about the grave clothes brought Peter and John to faith? What was so peculiar about them? The account may have come down to us through one of the soldiers, for by the time the women arrived, the stone had already been rolled back. Have you ever asked why the stone was rolled away? The stone wasn't rolled away to let Jesus out of the tomb. If his body could pass through grave clothes and locked doors, escaping the tomb wouldn't have been any problem, rather, the stone was rolled away as a sign of God's power to the soldiers, to draw the disciples attention to the empty tomb, and to let humans in to see. What Was Jesus' Body Like? Was Jesus raised "bodily" from the dead? That is, was his resurrection body the same physical body as before? The answer is yes, but more. Jesus described it as "flesh and bones" (Luke 24:39c). He could eat (Luke 24:42-43; Acts 1:4). His body could be touched and handled by others (Matthew 28:9; Luke 24:39b). He could walk and talk (Luke 24:15), even cook (John 21:9), just as a normal human body. Yet Jesus' wounds were still visible in his renewed body (Luke 24:39-40; John 20:20, 25-27). Jesus could be recognized by others -- but only when he wanted to be. The timber of his voice remained the same (Matthew 28:9; Luke 24:16, 31; John 20:14-16, 20; 21:4, 12). Jesus could enter locked doors (John 20:19, 26) disappear (Luke 24:31) and appear (Luke 24:36) at will. What I see in Jesus, is that his resurrection body had the ability to navigate in the physical world, but was not limited to the physical plane. In lesson 5, we'll talk more about what our own resurrection bodies will be like. It is clear that the New Testament intends us to see Jesus' resurrection body not as something completely different than his physical body. It is clearly one that has continuity with the old, but it includes new powers and abilities. Was Jesus raised bodily from the dead? The clear testimony of the Gospels is: Yes, indeed! Q4. What do we know from the Gospels about the properties of Jesus' resurrection body? What was he capable of in this new body? Before we leave the Gospels, it is important to make one distinction that is sometimes blurred in trying to understand the resurrection, that Jesus' resurrection and his ascension are two related but different events. Jesus' resurrection was when his body left the tomb and appeared alive to his disciples and others, never to die again. Jesus' resurrection refers specifically to his victory over death. His ascension to the right hand of the Father refers specifically to his exaltation by his Father to the highest place. Sometimes in the New Testament these are combined together as being glorified, exalted, or entering into his glory. Jesus' ascension is the final aspect of his resurrection from the dead; his ascension to his original and rightful place in God's presence. Q5. What is the difference between Jesus' resurrection and his ascension? How do the two fit together? In what sense is the ascension the completion of the resurrection? Jesus predicted his death and resurrection on the third day. Jesus ascended into heaven and sits at the right hand of God the Father. The evidence that Jesus' resurrection actually took place is excellent, as we'll see in the next lesson. No other major religion claims the resurrection of its founder. And it makes a difference in what we believe will happen in the future. Because Jesus lives, our hope in God is rock solid and our confidence in the future guaranteed! Father, thank you for Christ's willingness to "endure the cross" for the "joy that was set before him." Thank you for the clarity with which the gospels tell us the good news of the resurrection. Help us to proclaim it unashamedly. In Jesus' name we pray. Amen. This section draws heavily on Ladd, Resurrection, pp. 84-88. Othonion, BDAG 693. The term keiria, "binding material," used to describe Lazarus' grave wrappings, may refer to some kind of webbing (BDAG 538). C.K. Barrett (The Gospel According to St. John (Second Edition; Westminster Press, 1978), p. 404) sees the meaning "bandage" attested in the papyri, and observes that "such winding strips that seem to have been in use in Jewish practice." He sees othonion as "a linen bandage, such as might be used for wrapping a corpse" (John, p. 559), and cites Moulton and Milligan for the phrase othonia euona, "fine linen wrappings for a mummy." Catholic scholar Raymond E. Brown (The Gospel According to John (Anchor Bible; Doubleday, 1970), 2:941-942) provides an extended note designed to defend the idea that the Shroud of Turin (a linen sheet 14 feet long and 4 feet wide) could have been described by othonia, rather than the modern interpretation of "linen strips" or "bandages." He says there is no evidence that Jews wrapped their corpses with bands or strips similar to those used for Egyptian mummies. "Granted the obscurity of the term," he concludes, "we had best translate it vaguely as 'cloth wrappings.' " Danker observes concerning the word othonion, "The applicability of the sense 'bandage' in our literature is questionable" (BDAG 693). S.H. Hooke, The Resurrection of Christ (London: Darton, Longman and Todd, 1967), p. 79, cited by Ladd, Resurrection, p. 94.